PIKO recently released an all new model in G scale of a General Electric (GE) diesel locomotive to complement its growing line of U.S. style freight and passenger cars. For a prototype, they would have been hard pressed to choose a better locomotive to make, since this one represents what is likely the most widely produced industrial diesel ever made in the U.S., with production spanning more than 35 years. Whether it was in switching service at an industrial plant, as a main line railroad’s repair shop mule, or as the primary road power for a mining or sugar plantation railway in some exotic foreign locale, you could find GE locomotives such as this little 0-4-0 most any place. A number of them are still in service today, mainly at tourist railroads or museums, but some are still diligently working for industrial owners like grain elevators, a testament to their functional design and longevity. An example very similar to PIKO’s “Blue Goose,” GE’s I-B1 style 25-ton diesel resides at the National Museum of Transportation in St. Louis, Mo. Built in 1942, the only real difference between this prototype and this model is its angled side steps versus the straight steps on PIKO’s G scale I-B2 version. 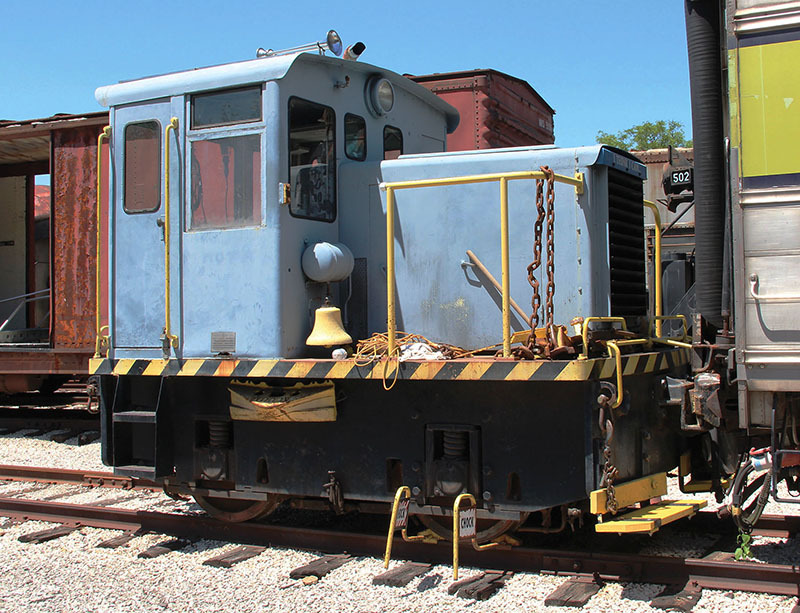 Starting in 1938, General Electric began making a small 23-ton box cab diesel, mainly for use by industrial operations. By 1941 the design had become popular and evolved from a stubby box cab into an equally stubby end cab locomotive of 25 tons. With the entry of the United States into World War II, and wartime emergency orders from the U.S. Government, these locomotives were made in quantity for Army Depots, Navy Shipyards, and a wide variety of defense industries and public sector needs; postwar many were available as surplus. The small switcher proved to be a very popular design for GE, and by the time they ceased production in 1974, more than 500 had been built to the same basic pattern, only slightly modernized internally and streamlined externally over time. 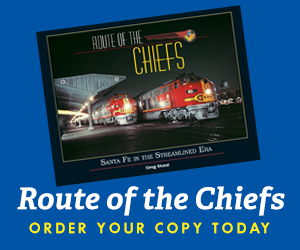 Using information in Jay Reed’s book Critters, Dinkys & Centercabs (2000, Rio Hondo), PIKO’s model represents a locomotive that the author terms a type “I-B2” version, due to the location of the headlight on the cab ends, the style of the steps, and other identifying features. The I-B2 is the second type made, leading to the type I-C, when the exhaust stack was moved outside to the cab front wall and the headlight was moved to the front of the hood. Viewing a prototype is quite convenient for me, as my local transportation museum, The National Museum of Transportation, has a nearly identical “I-B1” locomotive produced in October 1942. The I-B1 type dates from December 1941 to October 1942, and the type I-B2 saw construction from January to November 1943. Later versions of the GE 25-ton locomotive had rounded hood corners, as well as many other minor identifying features that changed over the years. One thing that held true for their entire production run was the Cummins 150-hp diesel engine power plant, and the GE generator and traction motor arrangement. A single traction motor was hung off the rear axle, with the front axle powered via sprockets and roller chains. The 25-ton design could be supplied for narrow gauges down to two feet, as well as gauges wider than standard gauge (4 feet 8.5 inches). Piko’s “Blue Goose” (#38502) General Electric 25-ton diesel locomotive model features a light blue body with black frame, walkways, and pilots. The pilot facings receive yellow safety striping matching the hue of the surrounding sill stripe and handrails. 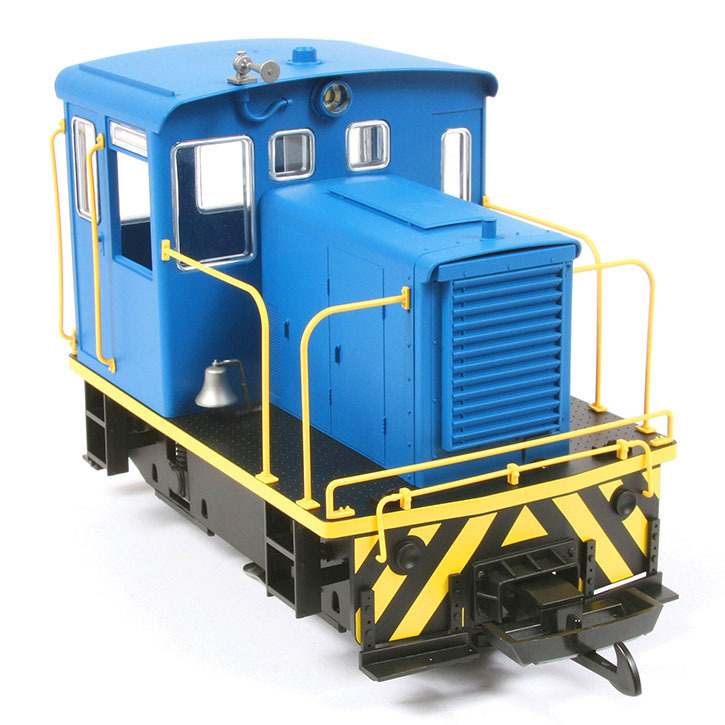 While this model may look relatively plain, it is entirely prototypical, and captures the appearance of GE’s little diesel well. The modeler applies the provided sliver air horn and bell details to this otherwise fully assembled d.c.-powered release, which lists for $199.99. Based on available information, the model scales out very closely to all the major external dimensions of this class and vintage, though the wheelbase is just a tad short, by about 5/32nds of an inch. Given these prototype dimensions, the model works out to as close to 1:24 scale as is feasible. I won’t be getting into the whys and wherefores of “What is G scale,” as it is sure to open a messy can of worms; suffice it to say, the model fi ts well and looks the right size with commercial models already in the marketplace and is a great addition to the hobby. The model is seve inches long over the footboards and coupler housings (nearly 10 inches over the entire coupler hook), four inches wide at the cab, and about five-and-a-half inches tall above the railhead. PIKO captures the look and feel of these typical GE locomotives exceptionally well; from the tiny drivers hidden behind slab side outside frames, to the seemingly undersized engine hood. 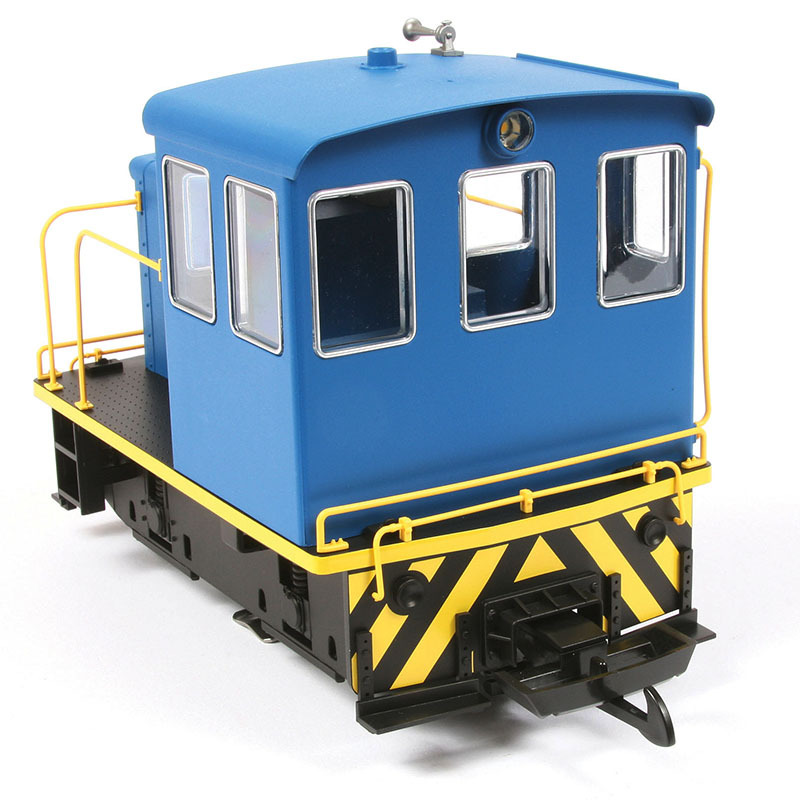 The new diesel switcher is being offered in several choices of colors and road names, as well as a unique battery powered track cleaning locomotive — more on that offering later. Traditional large-scale design track sliders aid in power pick up, giving six points total for collecting electrical power from the rails. PIKO encloses this switcher model’s motor in a typical large-scale protective block inside the hood for weather resistance. The model can be converted to digital operation with separately sold PIKO items and the design is also sound ready. The model comes packaged in a sturdy box and is well nested inside custom foam clamshell inserts and plastic wrappers. We had no shipping damage on MRN’s samples. Paperwork included separately in the box consists of an exploded parts diagram, a warranty page, and a small booklet in several languages on care and use. This booklet includes many more detailed drawings of parts and assembly, as well as several wiring diagrams. There are some additional detail parts included in the box that the modeler must apply: a locomotive bell in its yoke, and the air horn. To mount them, you only have to press them into their provided holes. A nice touch is the aftermarket adaptor mounts for those modelers who wish to switch to Kadee knuckle couplers (#831 or #909). Each model comes with the ubiquitous G scale “hook and loop” couplers already installed. The samples were perfect in appearance, no loose parts, no poorly applied parts, and a paint fi nish second to none. The model is primarily made from injection-molded plastic, and the various handrails and delicate grab rails are molded in color in a tough flexible engineering plastic to minimize breakage. Each model is finished in matte colors, with some individual details picked out in appropriate coordinating colors, such as zebra stripes on end beams or a chrome effect on window sashes. Any applied lettering or numbers are crisp and distinct. Detail includes textured walkway surface surrounding the hood, poling pockets on the pilots, and separate footboards. The overall level of scale detailing for this model is quite good, even though the prototype is somewhat basic. While there are very few rivets or bolt heads (the real locomotives were primarily of welded construction), they are there where they should be, and there is a raised non-skid bump pattern on the walkway surfaces. All the major detail parts are separately applied, which will make kitbashing easier for those so inclined to start cutting. While the model is very light in weight due to its small size (it weighs just under three pounds, coming in at 46.2 ounces), it gives the sensation of heftiness right out of the box, which combined with the delicate detail and visual appeal creates instant “eyeball gratification” for the model. About the only complaint I could really dredge up is the almost complete lack of cab interior detail, which is very visible through the many cab windows. There is only a representation of the “backhead” wall and a dummy sub-floor, under which the various electronics reside; there is no control stand, seat, panels, gauges, or any other appropriate interior items. Another common item provided in G scale is also missing; there is no engineer figure, and I am grateful for that, as I would prefer to source my own scale figures elsewhere. The real test though is whether a model locomotive will run as well as it looks. In that regard, the PIKO models were all excellent performers. They each showed smooth slow speed operation, with no jolts or fitful starts, and they were responsive to the controls. I used a test loop of R1 radius train set track with some longer straight sections interspersed, some wider radius curves, and for power, a standard 1 amp starter set power pack. The model easily handles the R1 curves (approximately 48-inch diameter), and it could likely turn even tighter if need be, though the couplers would have to be altered to do so. Power pick up is via the two track slider skates, and one spring loaded carbon brush bearing on the back of each of the drivers, for a total of six pick up points. The model’s five-pole motor is designed for the usual G scale system of up to 24 volts input. The Rio Grande never had a 25-ton diesel like this PIKO model. However, Rio Grande did have a three-foot gauge switcher (D&RGW 50) that featured a similar appearance. With the benefit of three models to test simultaneously, I also checked and found that they were well matched to each other in motor performance, keeping a set distance between each other when all three were run on the track at the same time. Because of that, one could easily add a second locomotive to create a multiple unit lash-up of truly miniature proportions. Since it is a very small locomotive, I wasn’t expecting a huge pulling capacity. The models each handily pulled or pushed three large scale boxcars (with aftermarket metal wheels installed). At four boxcars the locomotives started to balk, with five it was a slog, and with six cars it was clear the model was in danger of being overloaded. Adding any gradients dropped the pulling ability, and since the track powered models do not have traction tires, it could be an issue if your layout has significant grades to traverse. The engine hood is already stuffed full of metal weight, so there isn’t much room to add more other than inside the cab, in the open spaces underneath the end beams, or along the inside surfaces of the side-frames. While not an outstanding performance of strength, the model has acceptable operations for the type of locomotive it represents. This is my personal rating, and takes into consideration that many modelers tend to run trains far too long for their locomotive’s prototype abilities. Documentation says the real 25-ton diesel should have pulled six cars on the level, but one assumes those tests were under ideal conditions and subject to advertising claims. Additionally, our scale models seldom perform in the way real world equipment does; mass does not scale down well. Since this is a large-scale model, it is important to note the motor polarity matches G scale standards as initially developed by LGB in Europe (positive power fed to the left rail). The directional LED illuminated headlights are a nice touch, with solid output at all speeds. There is also an LED cab interior light, another great feature, which can be turned off if desired. Placed under the left rear running board (under the cab) are two small slider switches to turn the cab light or smoke on and off, as well as a rotary pot that I believe would be for sound volume control. Molded into the cab roof interior is an enclosure for a speaker for a sound system, but the instructions do not indicate which parts to use to add that feature. The instructions do show the model is prepared for installation of PIKO’s digital decoder (#36122), and there are provisions in the cab roof for installation of PIKO’s 5-volt smoke unit (#36142). You would additionally add a 5-volt voltage regulator (#36143) on the circuit board for the smoke unit (these items are sold separately). Converting the model to digital control is almost as simple as the plug-and-play process in smaller scales. To convert PIKO’s switcher to digital, you must disassemble the model, remove the regular analog control wiring board, and replace it with a new digital control board. All connections are via screw post terminals and no soldering should be required. Track sliders are modified on this model with a unique added red plastic shoe that secures an abrasive material pad. The testing of this model demonstrated excellent track cleaning qualities. 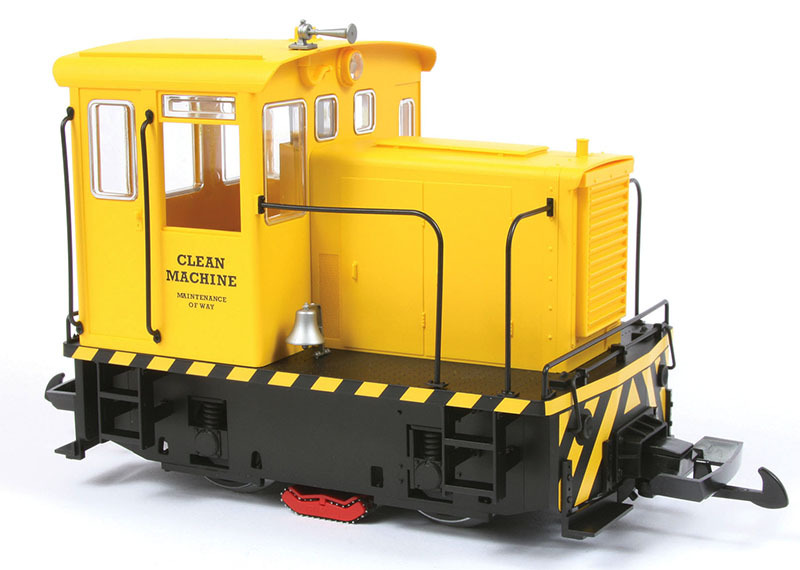 Perhaps the most interesting GE 25-ton switcher PIKO is offering is the battery-powered “Clean Machine” track cleaning locomotive, in its distinctive bright yellow paint. This model is outwardly identical to the stock track-powered models. However, the Clean Machine uses six AAA batteries for propulsion and lighting. These batteries are installed in a holder hidden behind the removable radiator front, and loading the batteries into the model’s hood is fast and easy. The model is then controlled by a three-position slide switch located under the cab (forward-off-reverse positions, there is no speed control). The instructions suggest using rechargeable batteries, and that a two-hour run time is possible. This model also ran very smoothly, though much slower than the track-powered versions. Since this model weighs 30 percent less than the track-powered version, you should expect a significant drop-off in subsequent pulling power, although it does include traction tires on all four drivers. 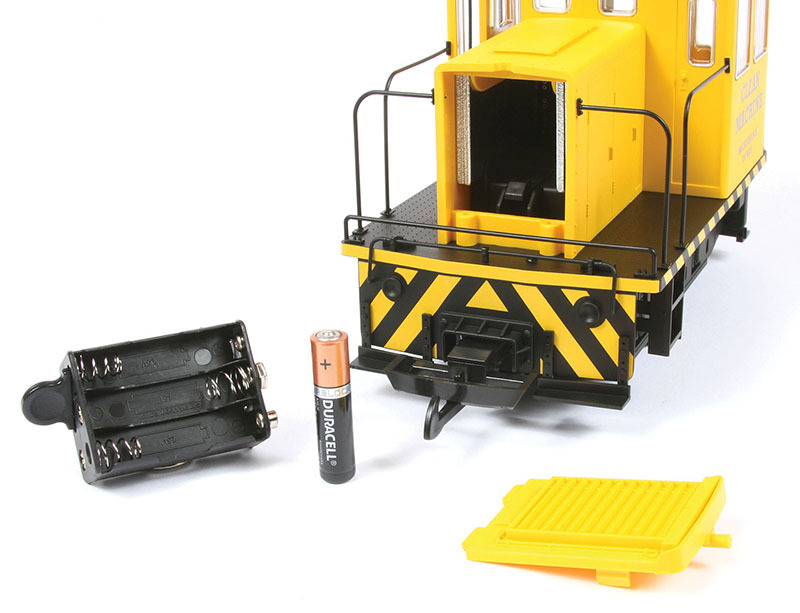 Six AAA batteries load into the nose and provide power for PIKO’s Clean Machine track cleaner version of the GE 25-ton diesel locomotive model. The battery installation is simple and easy. The major outward change for this model is that the stock track sliders for pick up have been altered by the addition of removable molded plastic shoes to which are fitted an abrasive grid material. I’m not sure what this material is — it appears to be similar to a drywall sanding pad, in that it looks like nylon window screen which has been coated with a gritty abrasive — but it works and works well. Letting the model run around my loop for a few minutes resulted in a visibly brighter railhead, and a noticeable amount of fine particles on the abrasive surfaces. For seasonal indoor railroaders, PIKO’s instructions do warn about using this model on light colored carpet, to avoid having the grit discolor the carpet. Large scale modelers with outdoor railroads have been fighting a battle to keep their track clean for decades, and this new model should be a handy weapon in that ongoing fight. Put it on the track, turn it on, and just let it merrily run until you have clean rails. One minor nit for this track cleaning version is the fact that these abrasive pads on the shoes will likely wear out, and I couldn’t find any information in the PIKO documentation for a replacement part number. The plastic shoe snaps open to release the pad, so replacing it alone should be easy. The design is ingenious enough that it could be retrofitted to nearly any model with this common design of track skate. There’s a special version of PIKO’s new GE 25-ton diesel locomotive that you’ll only find from Gold Coast Station Train Store. 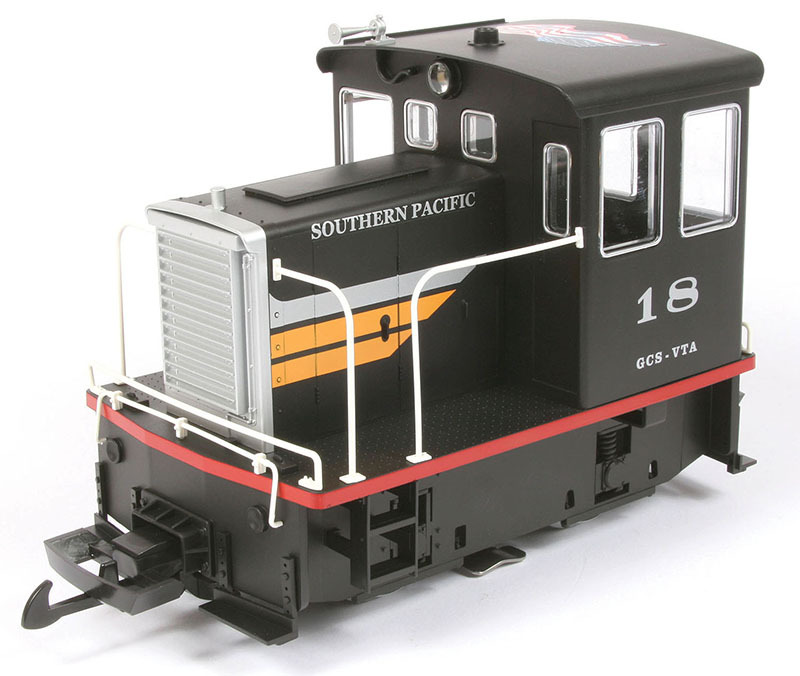 Decorated in Southern Pacific’s Black Widow livery, this exclusive release includes an American flag on its cab roof and both SP and Union Pacific heralds on the back of the cab. There are two road numbers offered by Gold Coast Station Train Store for this release. 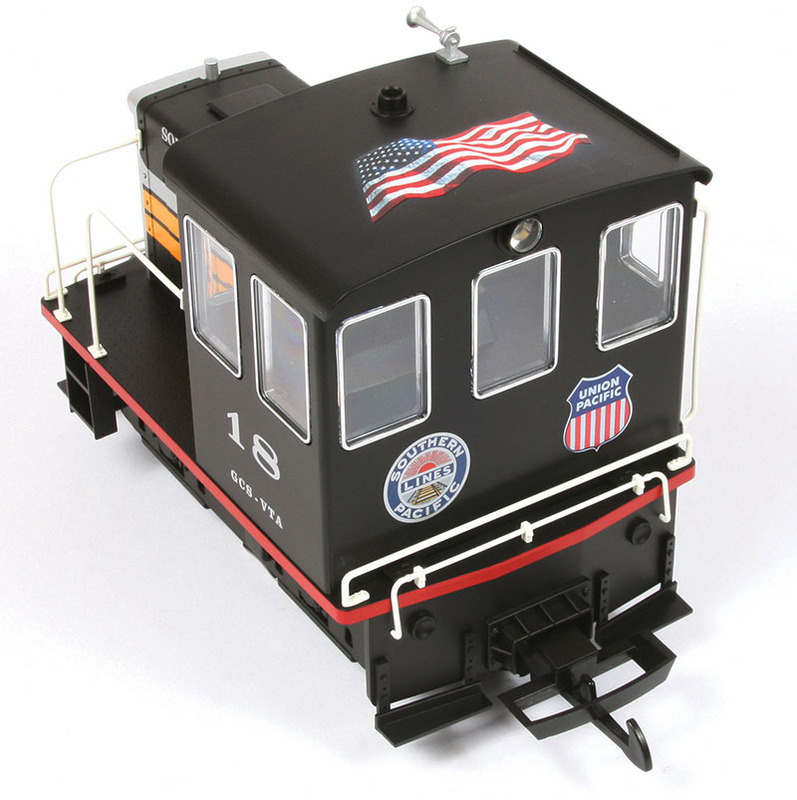 The final version supplied for review is a special paint scheme produced exclusively for California’s Gold Coast Station train stores in Tehachapi and Ventura. This Black Widow scheme includes both Southern Pacific and Union Pacific heralds on the cab rear, and an American flag on the cab roof, but otherwise these locomotives are operationally identical to the catalog track-powered models. These PIKO GE 25-ton switchers are available in two different road numbers directly from Gold Coast Station. For modelers who are addicted to super-detailing, this model will serve as an excellent starting point. As seen in the prototype photo, a certain amount of extra junk is almost required for proper daily operations. Various tools, re-rail frogs, a jack or two, and other parts will make the model really come to life. For the dedicated kitbasher or scratchbuilder, the sky is the limit for what you can create using this model as a basis; it would be enjoyable and fairly easy to replicate one of the original 23-ton box cabs of 1938 using the PIKO chassis, underframe casting, some sheet styrene, and elbow grease. 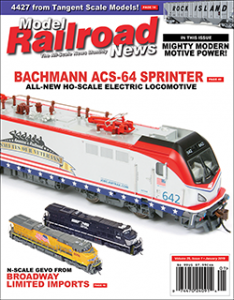 You can begin a journey with G scale with PIKO’s Mighty Hauler train set (#38150), which was reviewed in December 2018’s MODEL RAILROAD NEWS. The starter set release provides an orange GE 25-ton diesel locomotive with a pair of matching ore car models, as well as a circle of track, power supply, and controller. PIKO’s Mighty Hauler train set lists for $329.99. 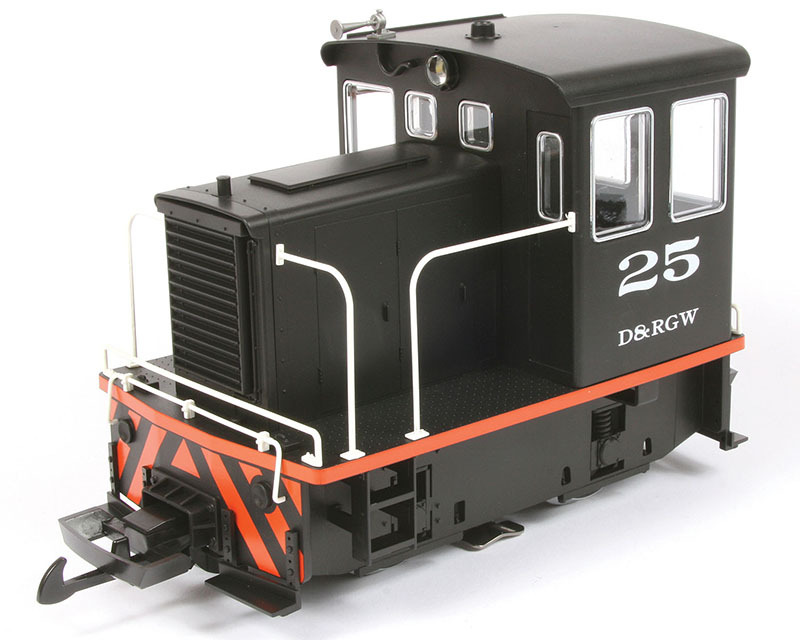 This new PIKO 25-ton GE diesel is just the sort of “fun locomotive” many in the hobby seek out. With a low price, this release will appeal to the entry level and casual seasonal users. Thanks to its accurate scale dimensions, this model will also be useful for serious modelers as a basic engine for multiple roles. The real 25-tonners were a popular and common prototype, so I suspect PIKO has a sure-fi re winner here. When one adds in the fine scale fidelity to detail, and exemplary running characteristics, I don’t see how any purchaser could be unhappy with this excellent little locomotive.